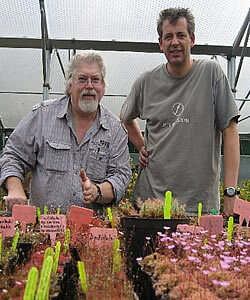 In August 2010 Allen lowrie spent 2 days at Triffid Nurseries inspecting a whole range of Cp's. Unsurprisingly, most of the time was spent looking at the Drosera! It was a wonderful experience for me to meet Allen who has forgotten more about Australian Drosera than I have ever known! Once he got stuck into the Pygmy Section at the Nursery, there was no stopping him! 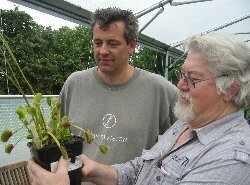 Many of the species currently growing at Triffid Nurseries were originally supplied by Allen ten or more years ago. In that time some have been lost from his own collection and he was incredibly pleased to see them thriving here in England. Allen took time to re-arrange some of my collection in light of some of the more recent taxonomic changes that have been approved. It was amazing for me to watch him identify all the pygmy species primarily using flower morphology. ....and his eyes lit up with this magnificent VFT - South West Giant which had traps over 4cm long! We managed to harvest some seed from this plant which he had with my compliments.